Posts Tagged "Trudeaumania in Canada"
Home » Posts Tagged "Trudeaumania in Canada"
Trudeaumania is sweeping Canada, again, as Pierre Elliott Trudeau’s son, Justin Trudeau, takes over as the Prime Minister of Canada for the Liberal Party, after almost ten years of Conservative Harper rule. 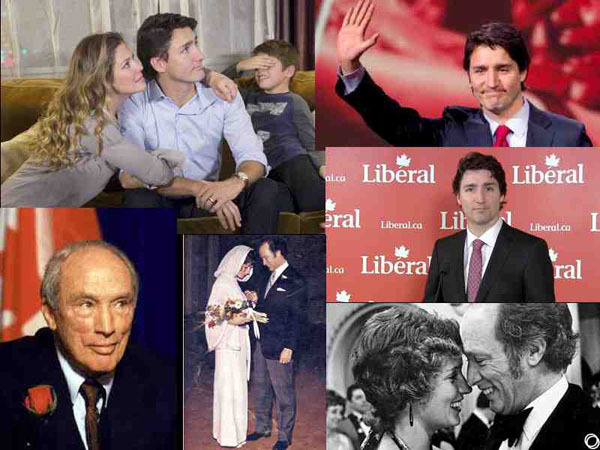 Justin Trudeau is good looking, with a good looking family, young, almost 44 years old. I have a few memories of his Father, and his Mother, Margaret, the beautiful “flower child” he married when she was 22 and he 52. Margaret came to La Coupe Salon in Montreal when she was the First Lady of Canada. It was late on a Saturday night, she had no appointment, was not recognized, turned away because no one was free to do her hair. But. She came back. And someone did her hair. I remember having long discussions, while she was there, with La Coupe’s owner, Charles Booth, should we or should we not do some PR . We decided to be chic about it, and do nothing. She must have loved it because she came back many times. One time, she came to the salon just before a visit to Paris, and was given a new haircut and color, something different. When she arrived back a short while later, major media talked of her great new hairstyle she got in Paris!! So much for being chic!!! (The photo bottom right may well be that cut?) I saw her later in New York, dining at Raoul’s, a trendy restaurant on Prince Street. And sat at the next table to Pierre Trudeau one night at Indochine in New York. a very hot restaurant then and now. He had no reservation, was about to be turned away, I think someone recognized him. For some reason he thought Guy, my husband, had arranged the table and he said “thank you.” He was very elegant. In every way. Can’t wait to see the impact of his son, Justin Trudeau.